Over Sept. 12-14 I attended Furry Migration, Minnesota's first furry convention, and it's off to a really strong start - 543 people, 115 of which were in the fursuit parade. 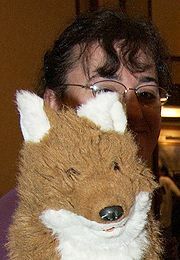 The convention was held in the Ramada hotel near the Mall of America and MSP Airport, and the guests of honor were Foxfeather R. Zenkova, Kyell Gold and Jeff Eddy (head of Sofawolf Press). Overall I had a very good time! 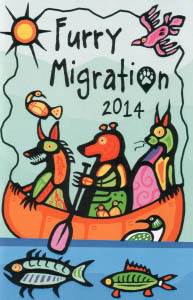 All first-year conventions are a bit wobbly, and Furry Migration is one of the least wobbly ones I've ever attented. They ran it really smoothly, especially registration - amazingly efficient. Apparently there was a bit of a last-minute shuffling of staff in the weeks leading up to the con, and there was no sign of it. The only major let-down was the limited sponsor brunch menu (probably due to budget constraints); some panels were unusually under-attended, but you can't blame staff for that. Despite the attendance of 543, the halls never felt horribly crowded. Friday night was a little slow, while Saturday was a blast - this is definitely a social con! Now all it needs is a zoo or general-purpose lounge, although I'm not sure where they could put one. Aside from the con suite (well-stocked with drinks and snacks), one of the nicest places to hang out was in the fresh air, there was an inner courtyard with lots of chairs. Holding the evening bonfire there went really well, great energy. Two young German Shepherds, year-and-a-half old Devaki and Makita, were shot and killed on November 12. Co-owners Shannon Hautala, Gary Kuoppala and Alexis Gunderson spoke with the press. The owners were doing chores on their farm in Clinton Township, Iron Range, Minnesota. The dogs ducked under a fence and ran into the woods. The owners started calling for the dogs as soon as they went out of sight. Hautala said she heard gunshots shortly afterwards. All they said is they can shoot anything that comes on their land and if the dogs come on their land, they can shoot them. See more: Videos of the convention by FurriesInMotion. Fandom member Spectra Vixen (Brianna Foxx) was severely injured in an car accident on Sunday morning and is currently in critical condition at Regions Hospital in St. Paul, Minnesota. Spectra spun out on ice and hit a guard rail which entered her car. She was flown to the hospital, which contains a level 1 trauma center. Her partner, Butterscotch Vixen, drove to the hospital to be by her side. Spectra suffered a severe cut from her upper right chest and shoulder, down to her knee. Her right arm was nearly detached at the scene, six to eight inches below the shoulder, and the doctors were unable to save it. As of Sunday night, Spectra was in the intensive care unit. By Monday, her condition had improved slightly, and Butterscotch reported "the docs seem happy with the numbers they see". Last weekend, your intrepid Flayrah editor-in-chief attended CONvergence in Bloomington, Minnesota. I had a smashing good time. I will also be attending Anthrocon this coming weekend, which will be an interesting excersize in comparisions, since both AC and CON are roughly the same size, but with very different focuses and philosophies. You can click on Read More to hear about my experiences at CONvergence. Check out wolves, the International Wolf Center and Minnesota on the ABC program, Good Morning America, Tuesday, April 30! The program will be broadcast live from Stillwater, Minnesota with Dave Mech hosting a pre-filmed wolf segment in Ely. In the 'conventions I wanted to attend this year' catagory, there was Convergence, which takes place over the July 4th weekend in Bloomington, Minnesota. I didn't make it this year, but the minions at Cthulhu Coffee did. Here's their Convention Report. Also of interest to furry fans may be their Hastur's Guide to Hosting a Room Party. Furry fandom has a dearth of good convention room parties, and we should attempt to learn from the experts.